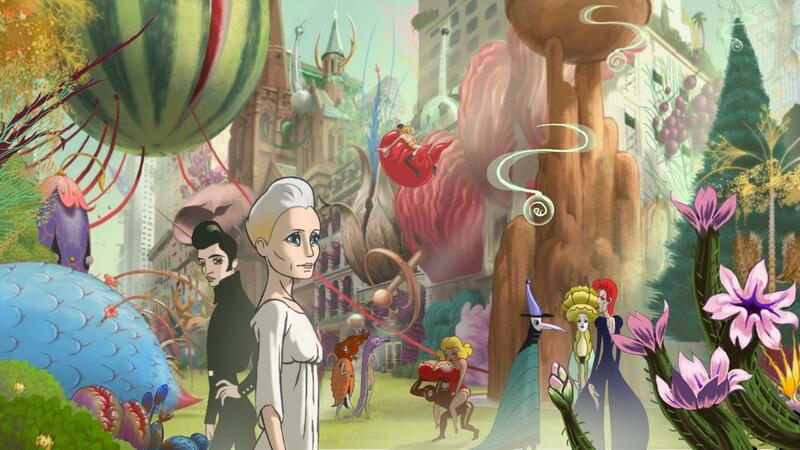 Ari Folman wowed a lot of people with his first film Waltz with Bashir (2008). A mix of powerful personal narrative doco, war expose and animation was like not much seen before. As is always the case when a first time filmmaker makes something so incredibly personal, there is always a question of where exactly they will turn to next. 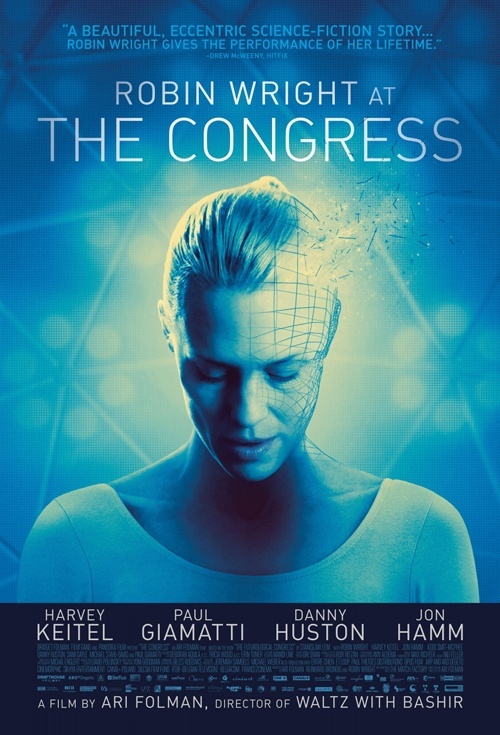 The Congress (2013) is definitely not what we were expecting. Folman has gone from documentary to a half animated, half live action sci-fi film about film hybrid. That is not a snappy description, because this is a film that defies easy pigeonholing at every turn. The film starts in a present day only slightly different to ours. Robin Wright is in negotiations for her ‘final role’ with the studio. A final role because the scanning of actors, recreating actual performances on a computer that we always hear rumoured about, exists in this present day. This first half of the film is one for the film about film nerds. It uses commentary about the current state of film, performance and the future of the film industry to shine a light on our current society and the flaws in its direction. The assumption made by the studios in the film is that people want to be young forever and that they want perfection in performances. When really the imperfections make the performance worth watching, just as imperfections and the variety they bring make life worth living. In that sense, though there are no space-ships or strange beings, The Congress is classic sci-fi in terms of the thematic approach. The film then flips as it races forward 20 years and we get what is a more overt sci-fi experience in the animated second half. There is trippiness and obliqueness all of a sudden in the visual and narrative approach. It did threaten to lose me early in this period, but then it brings it all back around to the central themes of the film, escalating them to remind us that these things do repeat themselves. And also that cynical men attempting to make big dollars will generally have no bounds. Plus the cars have ace Back to the Future II (1989) style barcode numberplates. As exaggerated, psychedelic or theme heavy the film gets at times, it never comes at the expense of emotional depth. Some of the core, human relationships and major poignant moments of the film are really quite crushing and affecting. Before the film, I was interested to see what kind of performances Folman would be able to elicit from his clearly talented cast. As a director, he has minimal experience in those areas, but whatever he did worked well. Harvey Keitel and especially Robin Wright deliver their best work for a long time. Keitel clearly relishes having a wordy, motormouth role he can sink his teeth into. Robin Wright though is a bit of a revelation. She has some incredible performances on her filmography, but this may be better than all of them. Playing herself, the mixture of fiction and fact in terms of scripting allow the film to make commentary on the place of women, especially ageing ones, in contemporary Hollywood. The performances are what makes all this possible though and I think the scene of Wright, Keitel and the scanning orb is probably the best scene of pure acting I have seen this year. In both halves, the film looks very pretty. The first is nicely shot and glossy, but never distractingly so. In the second, the animation is bright and reminiscent of classic Disney work, except for the enhanced performance capture that is reminiscent, though not the same, of Folman’s first film. The script, inspired by a novel, allows dense themes to be explored without ever feeling laboured. The dialogue is on point too, you could certainly imagine a studio exec making these same arguments for performer scanning today, that the head of the studio does in this film. Related beermovie.net articles for you to check out: Canberra International Film Festival 2014 preview and CIFF 2014: Particle Fever. Hmm. A hybrid! I always liked Robin and this sounds fascinating. Thanks, Tim.